سیف پناهی شعبانی, جبار, حمیدی, مهرزاد. (1396). بررسی و تحلیل شیوه های درآمدزایی باشگاه های فوتبال ایران و جهان. 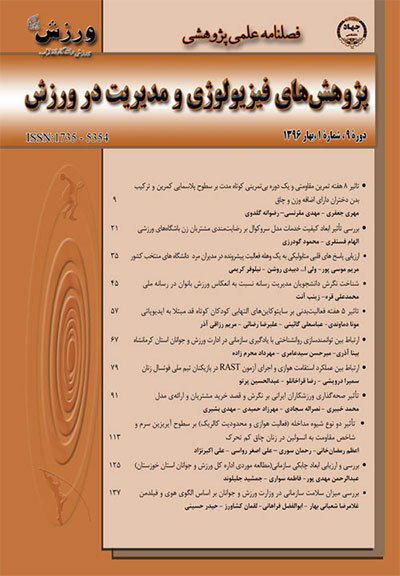 پژوهش های فیزیولوژی و مدیریت در ورزش, 9(3), 21-31. جبار سیف پناهی شعبانی; مهرزاد حمیدی. "بررسی و تحلیل شیوه های درآمدزایی باشگاه های فوتبال ایران و جهان". پژوهش های فیزیولوژی و مدیریت در ورزش, 9, 3, 1396, 21-31. سیف پناهی شعبانی, جبار, حمیدی, مهرزاد. (1396). 'بررسی و تحلیل شیوه های درآمدزایی باشگاه های فوتبال ایران و جهان', پژوهش های فیزیولوژی و مدیریت در ورزش, 9(3), pp. 21-31. سیف پناهی شعبانی, جبار, حمیدی, مهرزاد. بررسی و تحلیل شیوه های درآمدزایی باشگاه های فوتبال ایران و جهان. پژوهش های فیزیولوژی و مدیریت در ورزش, 1396; 9(3): 21-31. هدف تحقیق حاضر بررسی و تحلیل شیوه های درآمدزایی باشگاه های لیگ برتر فوتبال ایران و باشگاه های برتر فوتبال دنیا بود. روش تحقیق مورد استفاده در این تحقیق روش تحقیق کیفی بود و اطلاعات مورد نیاز از مطالعات کتابخانه ای و مصاحبه با خبرگان بدست آمد. جامعه آماری تحقیق شامل کلیه کسانی بود که در فدراسیون فوتبال، باشگاه های لیگ برتر فوتبال و دانشگاه های سراسر کشور در حیطه بازاریابی ورزشی فعالیت می کردند. روش نمونه گیری به صورت نظری صورت گرفت و تعداد مصاحبه ها تا رسیدن به مرحله اشباع ادامه یافت. در مجموع تعداد 43 شیوه برای درآمد زایی در باشگاه های فوتبال شناسایی و در سه بخش کلی درآمدهای حق پخش رسانه ای، درآمدهای تجاری و درآمدهای روز مسابقه دسته بندی گردید. بررسی ها نشان داد که میزان و تنوع راه های درآمد زایی در باشگاه های لیگ برتر فوتبال ایران در مقایسه با باشگاه های برتر فوتبال دنیا بسیار محدود تر می باشد. The purpose of this research was to investigate and analyses the methods of generating revenue by the world and Iranian premier football clubs. The method of the research was qualitative and the needed data were obtained from the library studies and interviews with experts. The statistical population consisted of all of people who worked in football federation, football clubs and universities in the field of sport marketing. Sampling was theoretically and interviews continued until saturation point. Totally 43 methods were identified for generating revenue by football clubs, and categorized to 3 main parts: media broadcasting, commercial revenue and match day revenue. The investigations showed, rate and variety of generating revenue in Iranian football clubs very restricted than to other football clubs in the world. Iranian Football Clubs to Boost Income must be equipped with a credible and global brand as well as massive supporters with appro priate sup port culture. 1. الهی، علیرضا (1387). موانع و راهکارهای توسعۀ اقتصادی صنعت فوتبال جمهوری اسلامی ایران، رسالۀ دکتری، دانشگاه تهران. 2. بازرگان، عباس (1389). روش‌های تحقیق کیفی و آمیخته، رویکردهای متداول در علوم رفتاری، چ دوم، نشر دیدار. 3. چشم‌انداز فوتبال (1387). نشریۀ رسمی سازمان لیگ فوتبال ایران، ش 4، پاییز. 4. چشم‌انداز فوتبال (1387). نشریۀ رسمی سازمان لیگ فوتبال ایران، ش 2، خرداد. 5. چشم‌انداز فوتبال (1388). نشریۀ رسمی سازمان لیگ فوتبال ایران، ش 9، زمستان. 6. چشم‌انداز فوتبال (1389). نشریۀ رسمی سازمان لیگ فوتبال ایران، ش 10، بهار. 7. چشم‌انداز فوتبال (1390). نشریۀ رسمی سازمان لیگ فوتبال ایران، ش 15، تابستان. 8. چشم‌انداز فوتبال (1391). نشریۀ رسمی سازمان لیگ فوتبال ایران، ش 18، تابستان. 9- Allmers, S. and Maennig, W. (2009). “Economic impacts of the FIFA Soccer World Cups in France 1998, Germany 2006, and outlook for South Africa 2010”. Eastern Economic Journal. 2009, 35, (500–519). 10- Aminuddin, Y. Lee, H. S. (2008). “Spectator Perceptions of Physical Facility and Team Quality: AStudy of a Malaysian Super League Soccer Match”. Research Journal of International Studies, Issue 8, 132-140. 11- Andrews, D. L. Mason, D. S. & Silk, M. L. (2006). “Qualitative Methods in Sport Studies”. Berg Publication. New York. 13- Baroncelli, A. & Lago, U. (2006). “Italian Football”, journal of sports economics, vol. 7 no. 1, February 2006, 13–28. 14- Brand Finance® European Football Brands 2011. (2011). “Top 30 most valuable European football brands”. The annual report on Europe’s most valuable football brands. © Brand Finance plc 2011. 15- Brand Finance® Football Brands 2012. (2012). “The top of most valuable football brands”. The world’s most comprehensive study of global football club brands. © Brand Finance plc 2012. 17- Callejo, M. B. And Forcadell, F. J. (2006). “Real Madrid Football Club: A New Model of Business Organization for Sports Clubs in Spain”. Global Business and Organizational Excellence. pp.51–64. 18- Correia, A. and Esteves, S. (2007). “An exploratory study of spectators’ motivation in football”. Sport Management and Marketing, Vol. 2, Nos. 5/6, pp.572–590. 19- Deloitte. (2010). “Spanish Masters Football Money League”, Sports Business Group. March 2010. 20- Deloitte. (2011). “Football Money League the untouchables”. Sports Business Group. February 2011. 21- Deloitte. )2012(.“Fan powerFootball MoneyLeague”.Sports Business Group. February 2012. 22- Desbordes, M. (2007). “Marketing and Football, An international perspective”. Butterworth-Heinemann publication. 23- Dimitropoulos, P. (2010). “The Financial Performance of the Greek Football Clubs”, sport management international journal, SMIJ – VOL. 6, Number 1. 24- Dobson, S and Goddard, J. (2001). “The economics of Football”, first published, Cambridge University Press. Landon. 26- Halabi, A. K. Frost, Lionel. Lightbody, Margaret. (2012). “Football history off the field: Utilizing archived accounting reports to challenge “myths” about the history of an Australian football club”. Accounting History. 17(1) 63–81. 27- James, J. D. Ross, S. D. (2004). “Comparing sport consumer motivations across multiple sports”. Sport Marketing Quarterly, 13, 17-25. 28- Poli, R. (2010). “Understanding globalization through football: The new international division of labour, migratory channels and transnational trade circuits”. International Review for the Sociology of Sport, PP: 491–506. 29- Ratten, V. and Ratten, H. (2011). “International sport marketing: practical and future research implications”. Journal of Business & Industrial Marketing, 26/8 (2011) 614–620. 30- Tainsky, S. (2010). “Television Broadcast Demand for National Football League Contests”. Journal of Sports Economics. 11(6) 629-640. 32-Tsamenyi, M. Onumah, J and Tetteh-Kumah, E. (2010). “Post-privatization performance and organizational changes: Case studies from Ghana”. Critical Perspectives on Accounting, Volume 21, Issue 5, July 2010, P, 428-442. 33- Woratschek, H. and Schafmeister, Guido. (2005). “New Business Models for the Value Analysis of Sport Organizations”. Universität Bayreuth. 34- Yebra Arcos, J. A. (2008). “The Impact of a Sponsorship Deal on the Football Team´s Brand Equity: A Case Study of the Football Club Barcelona”. Dissertation, University Strathclyde, Business school, Supervisor: Dr. Sean Ennis. Session: 2008/2009.